Holy Thursday celebrates the Last Supper, and Jesus’ service of love in washing his disciple’s feet. We remember the night on which Jesus was betrayed – but all the same, gave of himself without reserve. At Supper, Jesus loving those who were his own even to the end, offered his Body and Blood, under the appearance of bread and wine. This is how God reveals the extent of his love, through being completely given-up, and given-over to us who now share in his life. God doesn’t do this that we may selfishly receive. God did this to strengthen us so we too, can give. After Jesus gave the Eucharist to his Apostles, strengthening them with his Body and Blood, he then he enjoined on them the priesthood. This meant that Jesus’ self-giving love, his priestly offering, could be perpetuated throughout time by his Church, as one Body, in his absence. Tonight’s Mass is first of all the memorial of this institution of the Eucharist – that is of the Lord’s Passover, by which under sacramental signs, Jesus perpetuates the sacrifice of the old Law, transforming its meaning. The New Law is self-giving love. 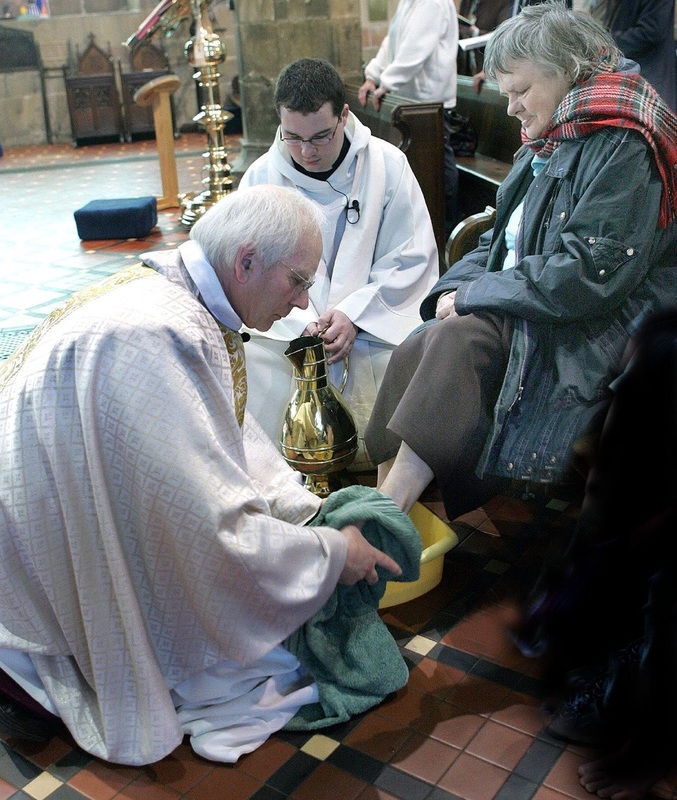 The washing of the feet is a visible sign of this law, but it didn’t stop there. The new sacrifice, God’s New Law, was consummated by the complete giving of Jesus on the Cross. Pope Benedict XVI called the sacrifice of the Mass the sacrament of charity. Charity is not a feeling; it is an act of goodness intended to give life. Jesus’ offering, beginning at table and ending on the Cross, is the supreme act of self-giving, is the New Law, and is the fullest expression of love! Holy Thursday night commemorates this love which led Jesus to wash his disciples’ feet, to nourish them with his Body and Blood. This was the beginning of Jesus’ complete gift of himself on the Cross, and again, at Pentecost where he gave us his Spirit. This gift is the greatest example of love. The gift is also intimate and personal; inviting and involving. It is a sign for us, so that we may do the same for each other through the giving of ourselves to one another. Amen.